At the Zoo from Winter 2017. I love the alphabets from Doodlebugs! They hve such wonderful collections. I love the Fairy Tales escpecially niw that 8 have a 3 month old granddaughter. Love their letter stickers and this is a cute kit. Thanks for the chance to win it. I enjoy their papers, especially their red, white, and blue! I like the letter stickers and the layered stickers! TFS! I love all the fun embellishments, the doilies, sequins, sprinkles, buttons, and brads. The colors are so playful and fun. Thanks for a chance to win. Doodlebug has the best colors! I love the alphas that I've had, and the sprinkles are always awesome! The Doodlebug Team did a great job with the sketches! Love all of Doodlebug's Collections. Can't pick just one. They are all so cute! Thanks for the chance to win! I always love Doodlebug collections for their fun, bold colors and themes. I think I will say this Yankee Doodle collection is my current fave, since we are right in the throes of Independence Day celebrations and there is red, white and blue everywhere! I love parades and street fairs and concerts! But my other favorite is Boos & Brews! I totally love fall! At the zoo has been my favorite! I love the Fun In The Sun collection from last summer. So beautiful and tropical. I have hoarding what I have left -- making sure I use it only for WORTHY projects! Thanks for the opportunity to win! I love the Springtime Collection. They are bright and cheerful colours. They give any project a happy feeling. Thanks for the chance to win. The Yankee Doodle Collection is one of my favorites especially with Independence Day coming up. Love all the Doodlebug products. Thanks for the chance to win. I like too many pattern papers/kits to choose just one but I am a big fan of the letter stickers. I LOVE EVERYTHING Doodlebug design makes!!! Their products always make me smile. I'll admit that I'm a doodle-pop hoarder. They're just so cute and fun! Thank you for this exciting chance to win such a fabulous prize package! What a fun collections for summer!It would be perfect for photos of my grandchildren lighting off their sparklers and having fun with family on the 4th! Thanks for the chance to win. Awesome to have this opportunity to win this collection! I have always loved scrapping the red, white and blue! My grandkids dress up in grand style and send me a picture of all three of them every 4th of July! Family traditions are always treasured! Each of them have multiple scrapbooks of themselves as they are growing up, so I would love to put this collection to use! Thanks Doodlebug and PageMaps! Love all the paper collections but my favorite would be Friendly Forest. Love Doodlebug! I use a lot of the embellishments and really appreciate the color pallet and that they continue to develop new collections with these colors. Things I have from a year ago can be used with new collections. I love all of Doodlebug. But I have to say that their letter stickers and papers are wonderful. I love the colors. So happy and joyous. Thanks for the chance to win. I love Doodlebug! My favorite collection is Fairy Tales!! It's so bright and colorful!! My fav collection would have to be the coffee break collection! Those papers and stickers are sooo cute!! Thanks for the giveaway! I Always love the bright colours from Doodlebug. Als my favourite products are the (letter) stickers. Love Doodlebug collections-my all time favorite is happy go lucky! Love love love the alphabets, they are my hands down favorite of all in the industry! Everything Doodlebug offers is always so refreshing! I think Friendly Forest has been my most favorite! I love the enamel shape "sprinkles" from Doodlebug Design. Boos and Brews is my favorite collection. Fabulous prize to go with your fabulous sketch! My favorite Doodlebug is Fun In The Sun with all the bright colors. Doodle bug is my absolute favorite company so there is soooo many to choose from it is hard to choose just one. OHHHHHH.....I think Fairy tales has to be one of my top favorites. I could go on and on! UGH! I am totally in love with Doodlebug's zoo line right now! SO excited to see layouts created with the July sketches! What fun and they are great! LOVE Doodlebugs sprinkles and alphas and also the weight and colors of their papers. Super quality! Thanks for a chance to win! I'm loving the Hat's Off collection, but this one is probably my favorite! I'm a big Doodlebug fan--probably my favorite is the Sweet Snowman--something about it always makes me smile. Fall Friends is still one of my favorites! I just love the little critters and colors too! Fall Friends Paper Pack is my favourite because I love the fall colours. Wow!!! I love all the Doodlebug Design collections, bit the One I love the most is Cream and Sugar...super cute!!!! Doodlebug sugar coating glitter! It's the best and stays put! Thanks for the chance to win! I love all the Doodlebug collections. They are always bright and upbeat, the way I like to make my pages. Doodlebug collections are great! The At the Zoo collection is fun and I love the coordinating washi tape!! My favourite DB products are their sprinkles and doodle-pops and I love all their collections! Its so darn cute. I say that every time I see doodlebug designs. LOVE them so much! I would go for this Yankee Doodle collection .... okay I love all the DB collections but living in the Netherlands this is a collection which isn't available uphere. So for all my American pictures which I still have to scrap would it be perfect and even it isn't the 4th of July. Woo hoo! A wonderful collection--thanks for the opportunity! I love the Puppy Love and Kitten Smitten collections. So adorable! I actually love all of the Doodlebug collections but those are two of my favs. I love all of their collections but the Fairy Tales line is so cute and my fave at the moment! I am a Doodlebug fan from farther back than I care to mention! Love their sprinkles and letter stickers! Oh my, everything Doodlebug is fun! My recent fave is Cream and Sugar! What a cute kit! Perfect to scrapbook my Flag Day (June 14) birthday. I love the lettering stickers. Great for all my American relatives pages. Thanks for a chance to win. Flea Market and Cream and Sugar have been 2 of my favorite lines but then again I have loved all of their collections!! I don't remember names, but I love the woodland creations from a few years back. I also love the colors. Sugar Shoppe and Hello Sunshine are my favorites! I love all their cute lines so perfect for colorful fun projects! I have been using Hello Sunshine a lot now that summer is here! 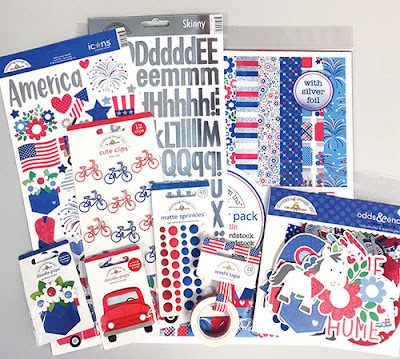 This patriotic set is so cute, but so are all the sets put out by Doodlebug. My favorite is the Sweet Treats. I absolutely love this Yankee doodle collection. Just finished making a birthday card and an anniversary card with it and it was tons of fun. My favorite part of every Doodlebug line is always the cute clips. I love the bicycle cute clips in this one, and ordered them the second I saw them! We had a huge family gathering this year for the 4th of July, and this collection would be perfect for scrapping the pictures. Santa Express but I have to say I've bought all Doodlebug designs. May the Force be With You as you repair the broken links on the site. Eleven years of awesomeness is a heck of a task to rebuild! Thanks for sharing every bit of it with us. I like the sprinkles; so much nicer to my fingernails than brads!! It would be so much fun to win!! I love everything Doodlebug especially their alphabets. I love everything Doodlebug! The bright colors and fun designs make great scrapbook pages and greeting cards. I would love to win the Yankee Doodle collection to scrap my Independence Day family photos. my favorite is actually this yankee doodle collection. I love anything red/white/blue and this is one of the cutest I've seen. I love all the matching accessories to the papers. winning this would be wonderful. thanks for the chance. I love this Yankee Doodle collection. Doodlebug has the best designs. I love this collection! perfect for summer scrapping and card making! Thanks for the chance to win. Cream and Sugar is one of my favs. Patriotic Picnic and the latest Easter colection are my faves but I love everything Doodlebug Designs! Great collection, I really like Doodlebug letters/alphas. Thanks for the chance! Wow! Love everything Doodlebug!! My fav is always the latest one!! My favorite collection is the cat one. I bought 2 of the collection. I am a huge Doodlebug fan!! I love all their stuff. Their sprinkles and alphabets are my favorite! Love there Santa Express collection!!! Thank you so much for the chance to win that super cute collection!!! traceur gps animauxa eu le plaisir de visiter le blog. what you get is Zaros accepting baffled what Seren failed -- and also the aboriginal alliance stands.If Saradomin wins and Seren's totally restored, afresh again, Seren's re-woven the pact. Agnate accord with Zaros -- if he's absolutely revived with fortnite items, he announces that he's baffled what Seren did... but this one differs.